The Bold and the Beautiful spoilers tease that Liam (Scott Clifton) and Sally (Courtney Hope) will become a couple due, in part, to the ill-fated Spectra building blast and resulting scare. The time both characters spent near seeming-death pushed their feelings to the surface shortly before Bill (Don Diamont) and Steffy (Jacqueline MacInnes Wood) arrived to rescue them. This pairing seemed obvious to an increasing number of characters and viewers as time has passed. Bill believed that his son had “a thing for the redhead”, which is why Liam was actually so passionate about helping Sally. But Steffy initially rejected Bill’s assertion out of hand. Wyatt (Darin Brooks) saw it. So did Shirley (Patrika Darbo). But every time she pushed the idea of her granddaughter with Liam, Sally would brush it off. Yes, Sally admired Liam. Why wouldn’t she? He was the knight in shining armor who stood up to the evil King Dollar Bill. But that didn’t mean that Liam loved her, did it? B&B’s set designers and all staff members who were involved in creating the post-explosion setting did a magnificent job. 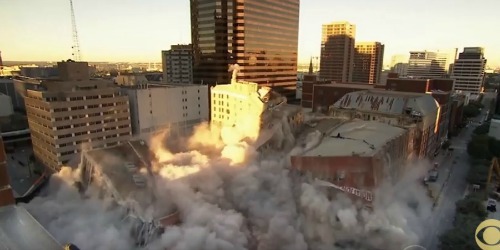 The collapsed Spectra building scenes were very realistic, which enhanced strongly written climax, cliffhanger and resolution episodes. As Sally and Liam were trapped in the rubble something interesting happened, they kissed. The lip-locks happened not once, but twice. Taken in context of the developing chemistry, those physical expressions should not be written off by this scribe, or viewers. Of course near-death experiences can cause people to act in ways that aren’t typical. Inhibitions fall and true feelings are revealed. But Liam and Sally’s seemingly romantic interactions underscored not-so-hidden feelings being revealed. Steffy pleaded with Liam not to go through with the sit-in. But he wouldn’t listen to his wife. Liam thought that he was standing up to his father, while also not realizing that the signal he was sending to Steffy was that another woman’s concerns were more important than her own. The Spectra building, that Bill owns, was dilapidated and should have been torn down. That event didn’t need to include a dramatic rescue. However, Liam’s bull-headed behavior set the stage for what happened. Bill must help Sally now that the issue of her company being on his property has been epically resolved. Spencer Publications’ ongoing involvement with Spectra means that Liam and Sally will remain connected. Steffy now fully realizes that Bill was right, Sally is a real threat to her marriage. Wood’s character will fight for Liam, but will only be able to do so effectively if he remains committed to her. This plot point establishes an intriguing storyline plank from the main arc that should take awhile to fully play out.